Autumn is in the air! 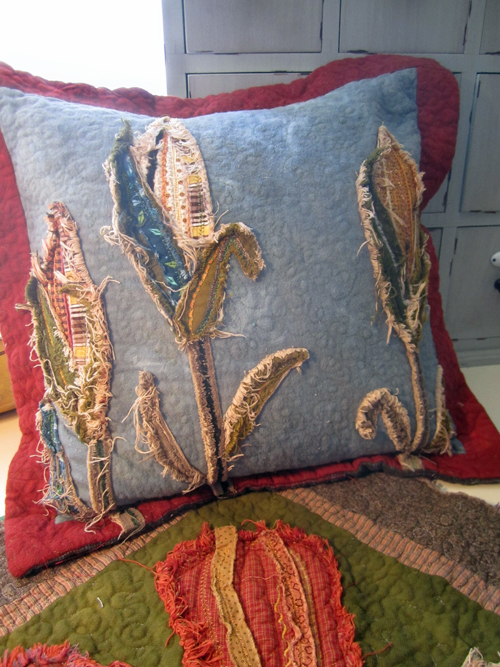 Miriam Rawson shows how to create the “raggy-applique” technique used on her Corn-on-the-Cob Pillow. The inspiration for this fall pattern is the opening of the little fruit stand in downtown Santa Clara, where I live. There is something about seeing the vine-ripened tomatoes, watermelons, cantaloupes, and other amazing treasures from the red earth that is so prevalent down here. Fall is my favorite season—the time the summer heat is gone, and the beautiful leaf colors start to show up in the mountains. The recipes for pumpkin pie, cookies, and the ‘scary’ jack-o-lanterns, as well as the aroma of roasted corn are wonderful to contemplate! 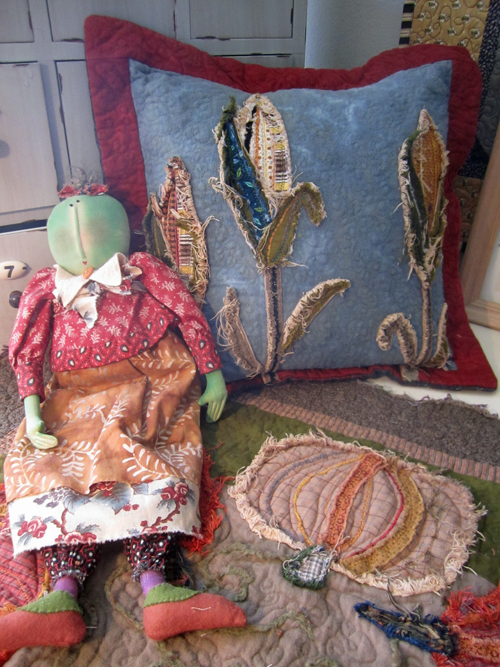 Hopefully, my quilt, fabric pumpkin,s and corn-on-the-cob pillow evoke the best memories of the fall season! 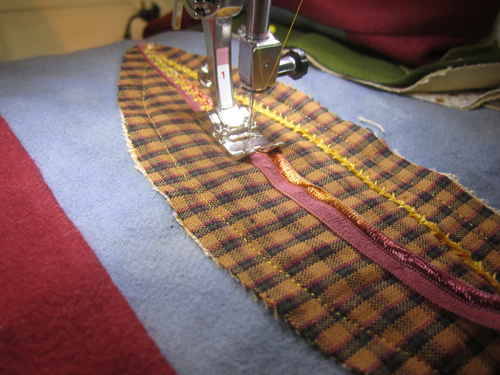 I have loved funky, ragged-edge quilting and clothing for a long time now. I think there is something carefree and in-your-face about stitching with such abandon. When I first saw the new hand-dyed, sueded flannels from Marcus Fabrics, I started envisioning the things I could stitch, the things we’d all love to touch, and the things I could wear! I will be working with Marcus Fabrics to come up with some ways to use this wonderful, soft, new stuff that looks like wool, but doesn’t cost as much. This “raggy” version of my corn-on-the-cob pillow is a companion piece to my Scrappy Pumpkins (Raggy Fall Collection by Fabric Folk). I’ll show you how to create this wonderful textured effect, and share my secrets for successful “raggy” quilts. In addition to Marcus’ flannels, I use their Oasis canvas as backing for each appliquéd piece, both in the corn-on-the-cob pillow and the scrappy pumpkin quilt. 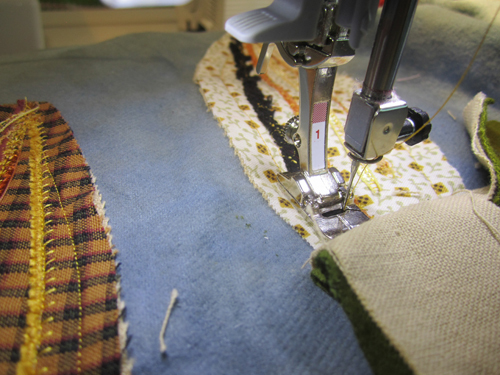 This canvas enables the project to have an especially wonderful “frayed” look. Follow the instructions on the Raggy Fall Collection pattern to cut out the background and border pieces. Stitch the borders to the background, and spray baste it to the batting. I use Fairfield’s Nature-Fil™ batting, a luscious bamboo/cotton/rayon blend. Add a thin muslin backing, using the same basting method, then use the basting spray to adhere the corn cobs (canvas layer first, then the cotton print) and the stems in place. Make sure you have a good place to spray the basting spray. If you use it inside, it may get on your floors and make them sticky. Sometimes I use a big box lid to spray smaller items and take larger things outside on my lawn to spray, hanging pieces on an outdoor fence or clothesline. 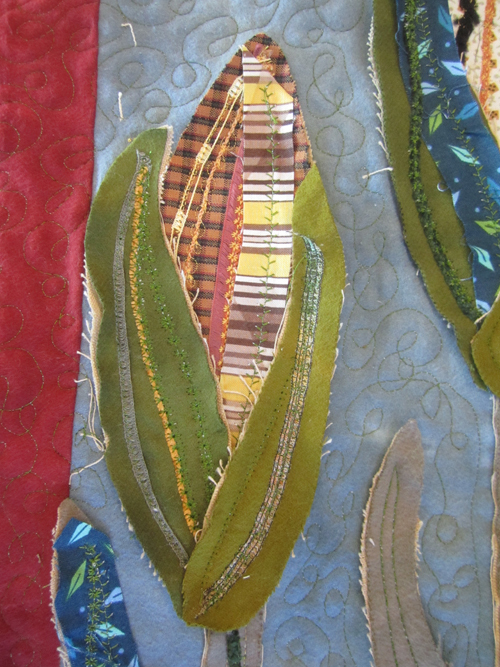 To embellish the corn cobs, use a variety of yarns, embroidery and other thread, as well as narrow strips of fabric. Some scrapbooking stores have wonderful cards of ribbons and other trims you can use for this kind of thing. 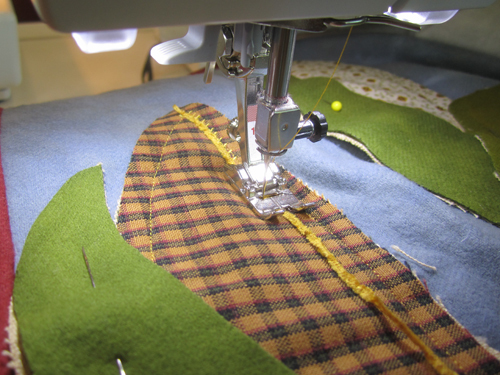 Just stitch them in place using the decorative stitches or zigzag stitch on your machine. 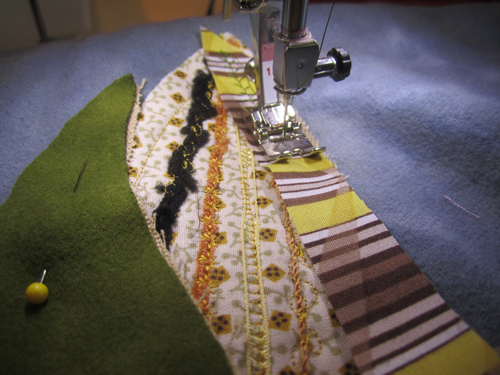 Tip: It is important to secure the stitches as you begin the embroidery. 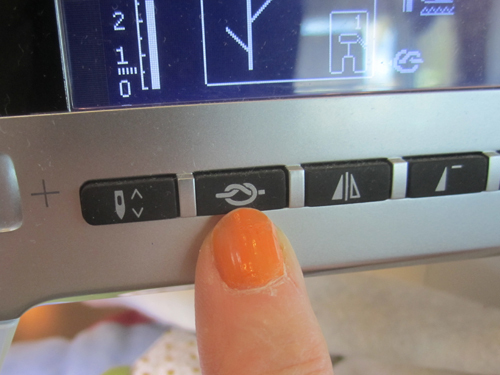 If your machine has this feature built in, use it; if not, reverse stitch at the beginning and end of the embellished row to prevent the threads from coming loose when you wash the project. 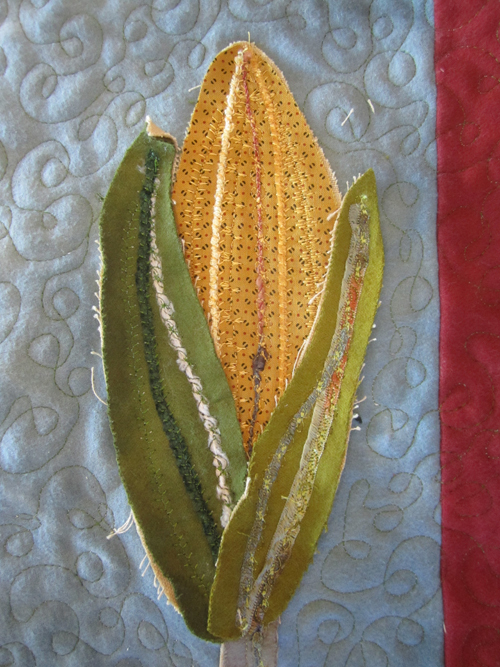 Add the leaves, one at a time, and embellish them. After you have finished the embellishment, quilt the background using a free-motion style. 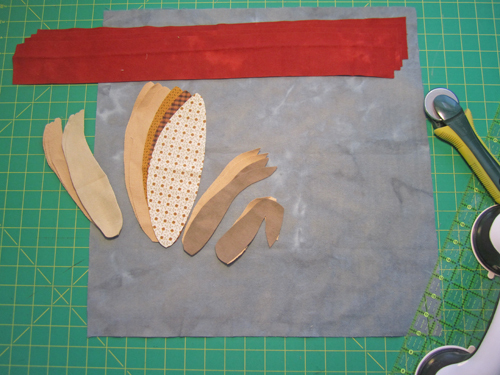 Follow the directions in the pattern to finish the pillow and insert the pillow form. 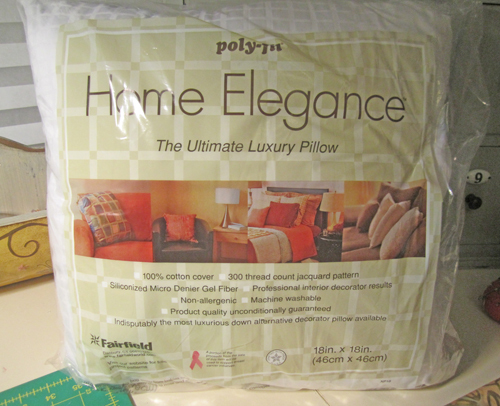 Fairfield Processing provided the quilt batting and wonderful pillow form. I usually make the pillow exactly the same size as the pillow form or just a tiny bit smaller. This enables the pillow form to fill out the corners and give it a more “plump” look. Make a collection of pillows, using the pumpkin motifs and the corn, to put on your sofa during fall season! Here is another picture of the finished pillow. The Miss Greene Tomato doll is one of my other patterns, which you can see on my website, Fabric Folk. The Corn-on-the-Cob Pillow is from Miriam’s Raggy Fall Collection pattern. Look for this and other Fabric Folk patterns at your local quilt shop, purchase and download them from Miriam’s Etsy shop, or order paper patterns on her website (fabricfolk .com). Download a free Primo Pumpkins pattern by Miriam on the Fairfield website. 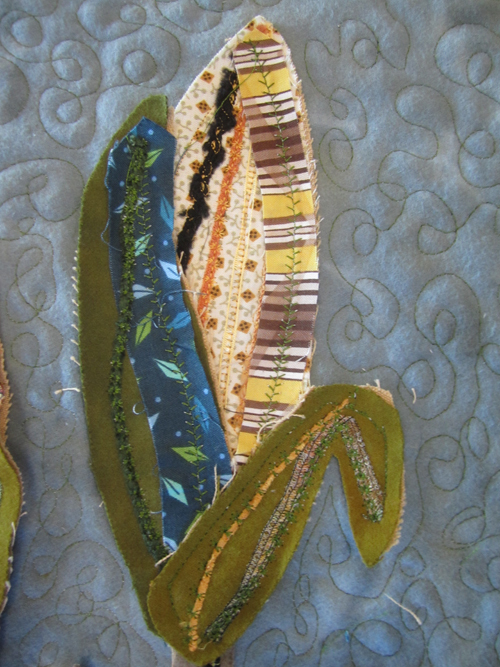 Previous Previous post: Turn Your Test Stitch-Outs and Orphan Quilt Blocks into Art! How or where can I purchase this Raggy Applique Corn On The Cob pattern by Miriam Rawson? The links in the article are no longer working.